While I was on the road to Road to California, I got an email from my longtime friend, fellow designer and publisher Darcy Ashton. If you’ve been following this blog for any length of time, you know how much I admire Darcy’s designs. In addition, for years and years she has been to me a boon companion, consultant, source of support and freely given information, in short a wonderful mentor. Now I find out that Darcy will be at the show as well! I’m so surprised and delighted! Darcy hails from Oklahoma and this is her first trip west of the Rockies. She’s with the Anna’s Awesome Appliqué Designs booth. 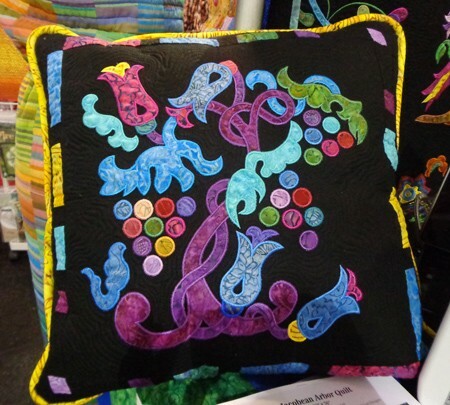 Anna digitizes designs so that you can stitch them in the hoop if you have one of those nifty embroidery machines. I couldn’t wait to see Darcy in person! It was thoroughly wonderful to get a chance to meet, greet, sit down, and chat in person. At a show like this, you have to steal the minutes, but we visited as much as we could, and I had a chance to look around Anna’s booth. 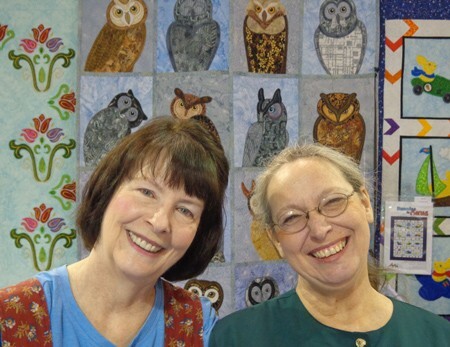 The quilt behind the two of us is “Owls With Attitude,” featuring designs from Darcy’s newest book, Outstanding Owls for Appliqué. I wrote about the book in September. 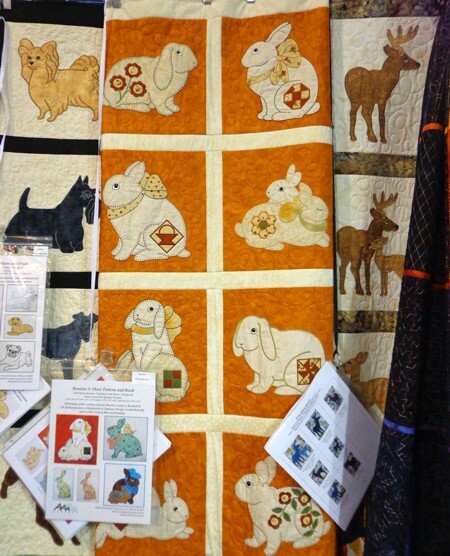 I also spied some of Darcy’s other animals, including her famous bunnies and the Darling Little Dogs. Anna works with other designers to digitize their designs. 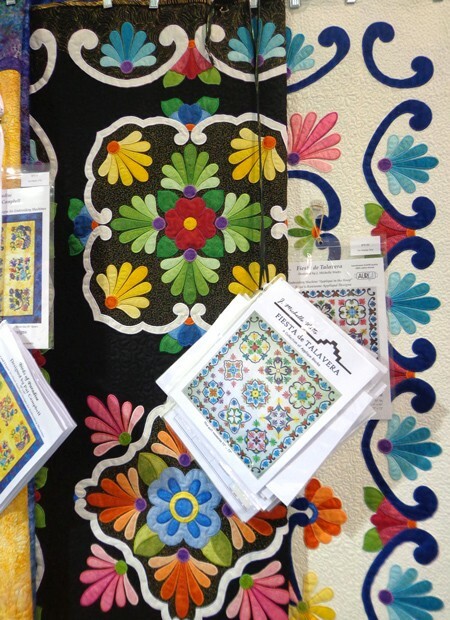 Fiesta de Talavera, designed by J. Michelle Watts based on Mexican hand-painted tiles. The incredible Jacobean appliqué of the late great Pat Campbell. I hope Darcy had a great time in California and comes back soon!! Her work really is beautiful. 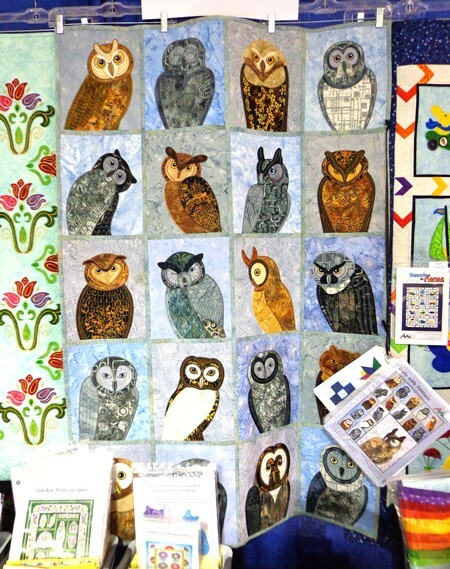 I especially love those owls. Hope it was a great show for both of you.